You have searched the Athletic Tape Info Center blog archives for 'skin irritation'. If you are unable to find anything in these search results, you can try one of these links. Kinesiology Tape or Athletic Tape? The first thing to make clear is that kinesiology tape is not intended to replace sports tape. The two types of tape have completely different functions, and both have important applications in the treatment of sports injuries. The purpose of this post is to help new users understand the difference between the two types of tape, as well as when to use each. Traditional sports tape comes only in rolls and is usually white. 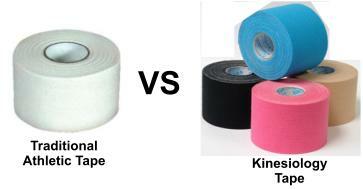 Kinesiology tape comes in both rolls and in precut applications for different parts of the body. Kinesiology tape also comes in a wider variety of colors, the most common being black, blue, pink and beige. A new kinesiology tape called RockTape, has combined fashion with function by offering 12 colors and patterns, including biohazard, black and white cow pattern, logo tape, and white and yellow “instant message” tape! Traditional athletic tape is thick and non-elastic. It can retain moisture for extended periods of time, which can cause skin irritation if not removed quickly. Kinesiology tape, on the other hand, is thin and stretchy, with properties almost identical to human skin. Because it is so porous, it releases moisture easily, allowing it to dry quickly after sweating, swimming or showering. The adhesive backing on regular sports tape is typically very strong, and can cause significant skin irritation or breakdown if applied directly to the skin. For this reason, a non-adhesive pre-wrap is generally used to prevent direct contact between the tape and the skin. This allows the tape to adhere to the pre-wrap and to itself, without actually sticking to the skin. 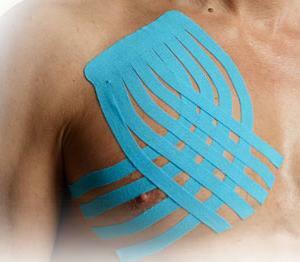 Kinesiology tape uses a much gentler, acrylic adhesive that almost eliminates the incidence of skin irritation. The combination of this hypoallergenic adhesive with the elasticity of the tape allows kinesiology tape to be comfortably worn for up to 5 days per application. Conventional athletic tape is wrapped tightly around an injured joint or muscle in overlapping layers until the area is virtually immobilized. 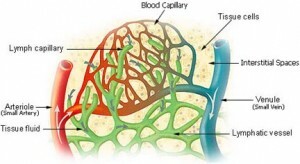 The compression created by this technique reduces circulation of both blood and lymphatic fluid, which could cause additional damage to an injured area if left on too long. For this reason, sports tapings are generally done a short time before an activity, and removed immediately following its completion. This differs greatly from kinesiology tape, which is almost never wrapped completely around any part of the body. Instead, it is applied directly over and around the borders of an injured muscle group or joint. The elasticity actually enhances both blood flow and removal of lymphatic fluid, which allows kinesiology tape to provide true therapeutic benefits. Because there are no limitations within a safe range of motion, athletes can continue to train and/or compete while wearing kinesiology tape. The main function of regular sports tape is to provide support and stability to an injured joint or muscle group by immobilizing it. This would be the taping method of choice in cases of severe injury, where any movement of the injured area could result in additional damage. Traditional taping is also indicated in situations where joint instability is so extreme that a tight tape job is necessary to provide additional support. The elastic properties of kinesiology tape make it unsuitable in situations where extreme support and stabilization are required. On the other hand, this same elasticity allows kinesiology tape to provide outstanding therapeutic benefits in the areas of recovery and rehabilitation. Because it increases both blood flow and lymphatic drainage, a kinesiology tape application can rapidly relieve swelling and inflammation, as well as accelerate the healing process. Other properties allow it to relieve both acute and chronic pain, which all injured athletes welcome. As pain and inflammation recede, normal muscle activation can be restored, returning strength and coordination to injured areas. A new, promising application for kinesiology tape is the possibility of safe, natural performance enhancement in healthy athletes. Check out my previous posts on Rock Tape to learn more about this exciting development. Comments Off on Kinesiology Tape or Athletic Tape? Kinesiology Taping: To Stretch or Not to Stretch? One of the features that makes kinesiology tape different from other types of therapeutic tape is its elasticity. Kinesiology tape is designed to stretch up to 40% beyond its “resting” length (i.e., its length with the paper backing still applied). The amount of stretch in the tape can be manipulated according to the condition and needs of the individual being taped. In addition to varying the amount of stretch in the tape, the practitioner can also choose to apply the tape with the muscle in either a stretched or relaxed position. When should I stretch the tape and when should I not stretch it? If I stretch the tape, how much should I stretch it? Do I stretch the entire application or only certain parts? When should I stretch the muscle and when should I not stretch the muscle? Should I stretch both the tape and the muscle, just the tape or just the muscle? Although the best way to learn the answers to these questions is to take a course in kinesiology taping, there are some basic rules of thumb that can provide some clarity to the issue of stretching. If unsure of how much to stretch the tape, it is better to understretch than overstretch. 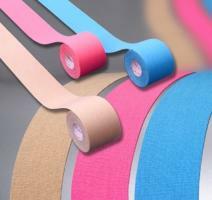 Kinesiology tape is stretched approximately 15% before it is applied to the paper backing. Therefore, benefits will be felt, even if the tape is applied as the backing is removed, with no additional stretch. Overstretching, on the other hand, can lead to skin irritation that may require removing the tape prematurely. When a kinesiology taping application indicates stretching the tape, the anchor ends of the tape should always be applied with no stretch. Only the body of the application should utilize tape in the stretched position. This will help prevent skin irritation or over-stimulation of the injured area. There are two main purposes for a structural or mechanical kinesiology taping: (1) to provide support for an injured muscle or joint, (2) to provide sensory feedback to discourage overstretching or over-contraction of an injured area. This is accomplished by stretching the tape and applying it while the muscles are held in a neutral or slightly contracted position. The amount of stretch can vary depending on the degree of support desired, but the stretch should never exceed 80% of the available stretch in the tape. The goal is to provide an “end feel” that will prevent moving beyond a safe range of motion. The purpose of a neurosensory or space correction kinesiology taping is to create more space directly above the area of pain and inflammation, reducing pressure and irration on the pain receptors. For this purpose, the muscle should be stretched to its maximum pain-free range and the tape should be applied directly from the backing with no additional stretch. After the tape is applied and the muscle is returned to its resting position, convolutions should be seen in the tape over the injured area. In addition to reducing pressure on the pain receptors, this type of taping creates an ongoing low level stimulation that helps to override the pain signals going to the brain. Microcirculatory applications are used to create areas of reduced pressure above the lymphatic channels in an injured area. This reduced pressure allows the lymphatic fluid responsible for localized swelling and edema to drain away through a nearby lymph duct. When properly applied, a rapid reduction of swelling occurs that is maintained as long as the tape remains on the body. For these purposes, the muscle is held in a stretched position while the tape is applied with a light stretch. Comments Off on Kinesiology Taping: To Stretch or Not to Stretch? Today I’m going to focus on the structural benefits of kinesiology taping. In the field of traditional athletic taping, the amount of support provided by the tape is inversly proportional to the range of motion of the taped area. In other words, to achieve high levels of support for an injured area, the tape must be applied tightly, which dramatically reduces range of motion. This is a double-edged sword for athletes who wish to continue training and/or competing as their injuries heal. In some cases the restriction caused by the tape will not allow them to execute the necessary movements to continue in their sport. In other cases, an athlete may unconsciously compensate for the lack of movement in the taped area and end up with another injury! What Makes Kinesiology Tape Special? One of the unique features of kinesiology tape is that it can provide structural support without limiting range of motion, as traditional athletic tape does. With the exception of serious injuries that require immobilization or restrictive support, this means that athletes can use kinesiology tape to safely continue to train and compete as their injuries heal. The “soft end feel” associated with a structural kinesiology taping application automatically reinforces proper movement patterns within a safe range of motion. When applying kinesiology tape, the two factors that can be manipulated are the amount of stretch in the tape and the amount of stretch in the muscle. In the case of a structural application, you STRETCH ONLY THE TAPE, NOT THE MUSCLE. The only parts of the tape that are not stretched are the anchor ends – this lessens the liklihood of skin irritation and helps the tape adhere better. 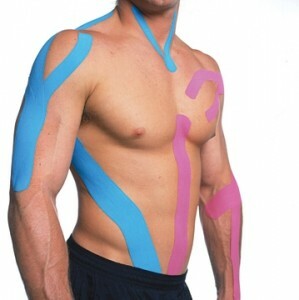 Following are the steps involved in a structural kinesiology tape application. 1. Remove the backing from the first 2″ of the tape and apply with NO STRETCH. Rub briskly to activate the adhesive. 2. Remove the backing from the rest of the tape, and stretch the tape to the desired tension – the more support desired, the greater the stretch. Important Note: You should not exceed 80% of the available stretch in the tape. If more support is required than can be provided by 80% stretch, you should be using traditional athletic tape. 3. Carefully holding the center part of the tape away from the skin, apply the final 2″ of the tape, with NO STRETCH. Rub briskly to activate the adhesive. 4. If desired, shorten the injured muscle by flexing or extending the joint in the appropriate direction. This will increase the sensory feedback from the tape, providing a physical reminder when an unsafe range of motion is being approached. 5. Press the center section of the tape onto the skin, rubbing briskly to activate the adhesive. The goal is to provide an “end feel” that will prevent a muscle or joint from extending beyond its current safe range of motion. My next post will provide details of the neurosensory application, used predominantly for pain relief. Check back for this important information soon! Today’s post will focus on the microcirculatory benefits that can be achieved through the use of kinesiology tape. This will provide details of how one can use kinesiology taping to reduce swelling, inflammation and bruising by enhancing the flow of fluids through the smallest vessels of the body. When part of the body sustains a traumatic injury, cells in the area burst and spill their contents into the extracellular space surrounding the injured tissues. This fluid is a major component of the swelling that accompanies an acute injury. When a large amount of this fluid collects in an enclosed area, it creates pressure on the blood vessels, lymphatic vessels and pain receptors. Severe swelling can actually reduce the circulation of both blood and lymphatic fluid to an injured area – the opposite of what it needs to recover and heal. How Does Kinesiology Tape Reduce Inflammation? When kinesiology tape is applied to an inflammed area using a microcirculatory application technique (see below), the lifting motion of the tape creates a space between the top layer of skin and the underlying tissues. This space creates a pressure gradient between this area and the surrounding tissues that encourages the flow of blood into the injured area as well as the removal of lymphatic fluid (swelling). The result? Swelling goes down, pain is relieved, and the healing process is accelerated! When applying kinesiology tape, the two factors that can be manipulated are the amount of stretch in the tape and the amount of stretch in the muscle. In the case of a microcirculatory application, BOTH THE MUSCLE AND THE TAPE ARE STRETCHED. Always begin by applying the anchor end of the tape with no stretch – this lessens the liklihood of skin irritation and helps the tape adhere better. Next, stretch the injured muscle as far as possible without causing discomfort. As the backing is removed from each section of tape, stretch the tape to approximately 50% of the available stretch and apply it directly over the lymphatic pathways of the injured area. Apply the tail anchor with no stretch. 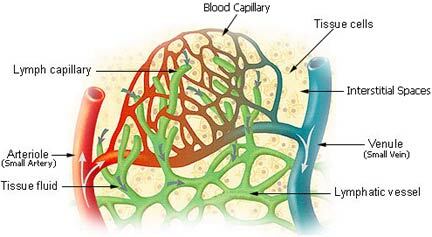 Because the lymphatic system consists of a mulitude of vessels, most microcirculatory or lymphatic applications are quite complex, in order to cover as many pathways as possible. If using kinesiology tape by the roll, the tape is usually cut into narrow strips or even in a basket weave pattern before applying. If using pre-cut SpiderTech Tape, the Lymphatic Spider is always selected. This convenient application is already cut into narrow strips, with step-by-step directions in the package. Because kinesiology tape applications are typically worn for up to 5 days, this is an ideal modality for long-term treatment of either acute or chronic swelling. Clinical applications range from the treatment of acute athletic injuries to post-surgical swelling control and relief from the painful, dysfiguring swelling of lymphodema. My next post will focus on the details of structural kinesiology taping applications.